The audio driver contains a security mechanism that apparently isn't getting disarmed properly for some people. The two people that have contacted me about this have reported that they simply exited the Windows app and then started it again, and repeated that process 3-4 times and it mysteriously worked from then on. Until I figure out why this is happening, if you run into this issue, give that a try. If you installed the Windows app prior to May 17 2012, click here for instructions on how to update your Windows app. Recently I discovered another cause of this issue for some people, which is that if they watch a Netflix movie in Internet Explorer, the movie doesn't show up, and instead the image is black. Because my program must use Internet Explorer, it is adviseable to first try watching a Netflix stream in Internet Explorer. If that isn't working, then my app won't work either. ... it means that you have used the "Browse Movies" button directly from within the Flix app. While there is a way to do that, users should be using a helper application I have made freely available called "Flix Movie Selector" for browsing and selecting movies. ... what it really means is that Internet Explorer on your computer doesn't have Silverlight installed. 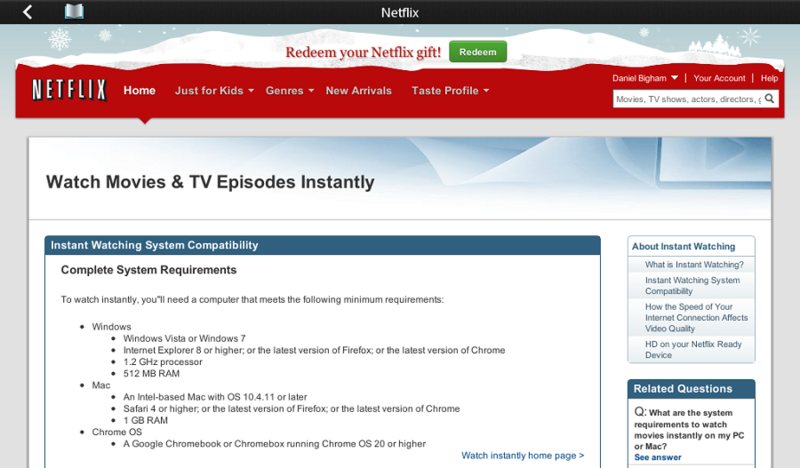 Simply open Internet Explorer (not Chrome or Firefox), and try watching a Netflix movie. You'll see the same prompting, and you can then go and install Silverlight within Internet Explorer. Once that is done try watching your movie on the BlackBerry again. If it still doesn't work, you may need to restart your computer (or simply the Flix app on your PC) for the change to take affect. Note that Flix, during movie playback, changes your audio playback device so that sound no longer comes out of your speakers. If the program ever crashes, the playback device might be left pointing to the Flix audio driver, not your speakers. Simply start the Flix program again, and it should correct this. Otherwise, if not, right click on your volume icon, select "Playback Devices", click the device that corresponds to your speakers, and then click "Set as Default". During summer 2012 Netflix changed their movie player to a newer version with different player controls. I updated the Windows app accordingly so that the movie would be full screen. However, some users are reporting that they still get the old player, and this results in the movie showing up on the BlackBerry with the player controls visible. I have yet to figure out why some people are being served the older player by Netflix. Hopefully this can be resolved soon. 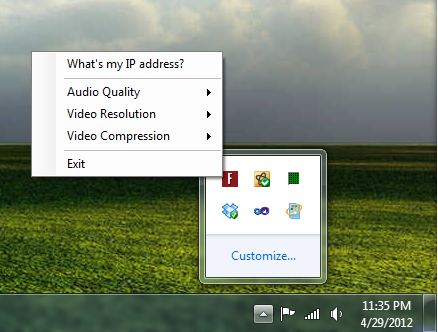 Your IP address will likely be something like 192.168.0.1 or 10.0.0.2, where the last two number groups may vary. If the program lists multiple possibilities and one of them looks like these examples, it is likely to be that one. Ensure that your Windows Firewall has an exception to allow Flix to talk on your local network. When you started Flix for the first time, it likely caused a Windows dialog box to be displayed asking if you want to "Unblock" the program and allow it to talk on either the local and/or remote networks. Hopefully you clicked "Unblock". If not, these Windows Firewall exceptions may be missing. If you are finding that the program cannot connect, then you should probably start by disabling Windows Firewall to remove the possibility that this is the cause. Also note that if you uninstall and re-install the Windows PC program, it should prompt you again for whether you want to unblock the program, so if you missed clicking Unblock the first time, that will allow you to have a second chance at responding to that dialog appropriately. If you got any sort of errors during the installation of the program, it may be due to a virus checker interfering. In these cases, disable your virus checker, uninstall Flix, log off of Windows, log back in, ensure your virus checker is still disabled, and then reinstall Flix. Then, check to see whether it is working properly. 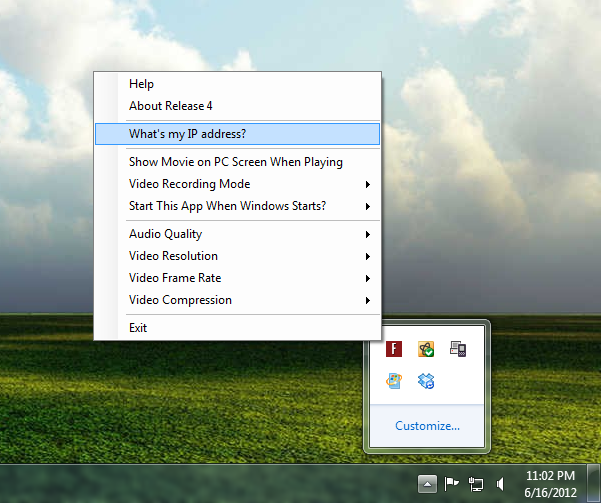 If that worked, go to a web browser on another computer running on your Wi-Fi network and go to the same address, but substitute for "127.0.0.1" the IP address of the computer running Flix (which can be found by right clicking the icon in the Windows Tray and selecting "What's my IP address?) If that doesn't display the "Hello!" text as it did on the computer running Flix, that indicates that something is preventing other devices on your network from connecting to your computer on TCP port 4559. If so, try disabling Windows Firewall, but if that still doesn't work, please contact me by email and I will try and help you troubleshoot: daniel.bigham.software@gmail.com. If you do determine that Windows Firewall is the problem, then rather than keeping it permanantly disabled, click Start and type "firewall". In the programs listed, click "Allow a program though Windows Firewall". Click the "Change settings" button and then scroll through the list until you find "Flix". Check the box(es) in the "Home/Work (Private)" column. (if there are multiple rows for "Flix", do this for each row) Then click OK. Note that there is a small chance that you might also need to check the boxes in the "Public" column if when you originally connected to your Wi-Fi network you told Windows that it was a "Public" network. It's always useful to ensure you're on the same Wi-Fi network. One poor user labored to get my app to connect, conversed over email with me several times, and then noticed that his BlackBerry was connected to his neighbours Wi-Fi! One final thing that's worth doing is to restart your Internet router, your PC, and your BlackBerry, and then try again. Computer networks can be finicky sometimes. Note that if you are at a hotel or using other types of public Wi-Fi, the router will likely be running in "isolation mode", which prevents devices from talking to each other over Wi-Fi. The speed of your Wi-Fi network will be the limiting factor for the quality settings that you will be able to use. For example, if the computer running the Windows app is hard wired into your router, then you will be able to use higher quality settings because the wireless bandwidth of your router won't be taxed as much. If your PC is not hard wired into your router, then there are three wireless transmissions happening at all times: The Netflix movie download from the Internet via the router to your PC, the Flix upload from your PC to the router, and the Flix download from your router to your BlackBerry. This triple download of data is significant, and so typically the higher quality settings won't work, especially if your BlackBerry is on a different floor of your house from your router. If you find that you are getting the "Buffering 10 seconds of video..." screen too often, then you will unfortunately need to try the lower quality settings. Another important factor is how you hold the BlackBerry. For example, if you have the BlackBerry on your chest and wrap your hands around the top corners of the BlackBerry, you may significantly reduce Wi-Fi transmission speeds. For example, from our bedroom, the BlackBerry will actually disconnect from our Wi-Fi network if I place my hands around the top corners of the BlackBerry, but doesn't have any trouble maintaining a Wi-Fi connection if I hold it gently using my thumbs and index fingers lower down from the top. Another way to improve transmission speeds may be to put the BlackBerry on your night stand instead of holding it. If you own the rapid charge stand, it can be convenient to set the BlackBerry in the stand on your nightstand. 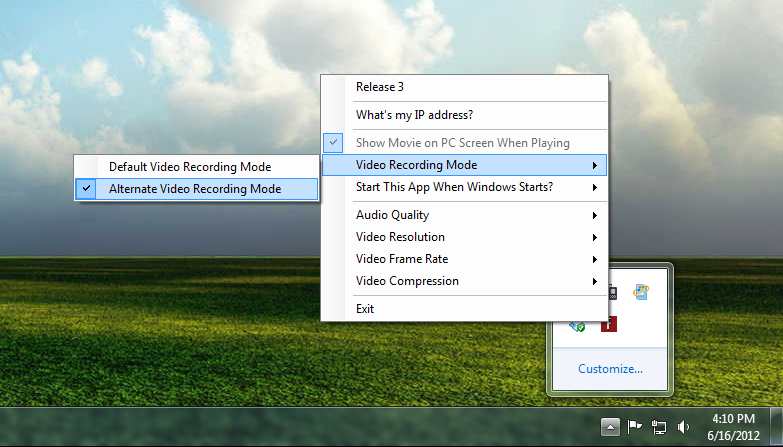 If you are receiving errors about the audio driver not being present, see this page.